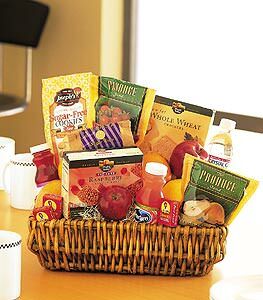 This deliciously healthy basket of fruits, crackers and juice makes a perfectly wholesome corporate gift. Great for all kinds of acknowledgments. Fresh fruits, along with crackers, cookies, juice and water, are delivered in a wicker basket suitable for keeping. Note: Same day delivery for this item may not be available in all areas.